As an attractive region, Peniche is home to luxurious resorts. The house is located near vast and almost desert beaches in the centre of Portugal. Close to the city of Peniche and a short distance from beautiful towns and historic cities, it offers breath-taking landscapes and tourist sites, like monuments, artefacts and thermal spas. Surfing and body-board, fishing and diving sites, boating, scuba diving, sailing, golf (in the dunes, overlooking the Atlantic), you'll find it all in a friendly environment. Enjoy the Portuguese Cuisine, a mixture of European with Oriental flavour. Plenty of bars and discos give you a lively night experience. Berlengas' islands, a National Park, are worth a visit. Supertubos is a world famous surf beach, ideal for beginners as well as for experienced surfers. Kids, teens and adults find beaches to suits their needs. Mixing rural with a fishing atmosphere, close to cities yet quiet and peaceful, Supertubos offers you, at a good price, a memorable stay. Swimming Pool: There is a heated swimming pool that may be used in the Atlantico Golfe Hotel. On summer, you may use the big swimming pool complex of Peniche. Beaches: You may find all kinds of beaches around: for little children, for adults, for experienced swimmers and for surfers, beginners and experienced ones alike. Tourist Information: We welcome every enquiry, even from casual visitants. We answer our enquiries pretty fast. If you want further details about the region, or the house, please contact the owner, even though you are not sure whether you want to come. You may contact us through telephone or email. For more detailed description, please call or write to the owner. You can have your meals at the garden. Floor with tiles, not lawn, whi is burnt by sea air. rented. at Casal Moinho. Ipossible to keep them at house forn rusting. The house has got all you need to enjoy a pleasant stay. Parking cars is easy. Books, magazines and toys for the children are available inside the house. The sun comes east from the front door and west from the back door. The neighbourhood is quiet. It is ideal for families as it has got all the facilities you need. Children may be kept safe within the enclosed back garden. The roads nearby are quiet. The owner is open to dialogue if you have special needs. Should you have any questions, please contact the owner by email or phone. Please contact the owner for long term rate. We had a great stay in Peniche. An easy walk to a beautiful beach, nice, well maintained home to stay in. Great backyard area perfect for BBQing the local seafood. We had great communication with the owner, Jose. He was always willing to assist and offer suggestions. Overall would highly recommend staying at this property, already making plans for my next trip. Jose the owner is aways very helpful with any requests . I would not hesitate to reccomend this accomodation . Tha house was good, with all appliances necessary. Though it was hot outside, the house remained cool. The waves were excellent and we found places where our small children could play in the water in small ponds. Portuguese cuisine was different and very good. Maison très agréable avec un barbecue qui vous permettra de découvrir de nombreux poissons frais à Peniche. Une semaine au top ! Très agréable séjour passé à Peniche. Emplacement idéalement situé pour pouvoir visiter les environnements. Je recommande ! Supertubos is situated on the centre coast of Portugal, 80 km (44 miles) north of Lisbon, on the south side of Peniche, within a 40 minutes drive from Lisbon airport. The region is a mixture of orchards and vegetable farming, lovely villages with windmills and perfect beaches. The touristic Óbidos, Caldas da Rainha, Batalha, Alcobaça, Mafra, Nazaré, Lourinhã are at a short distance. Supertubos is a world famous Surf Beach. 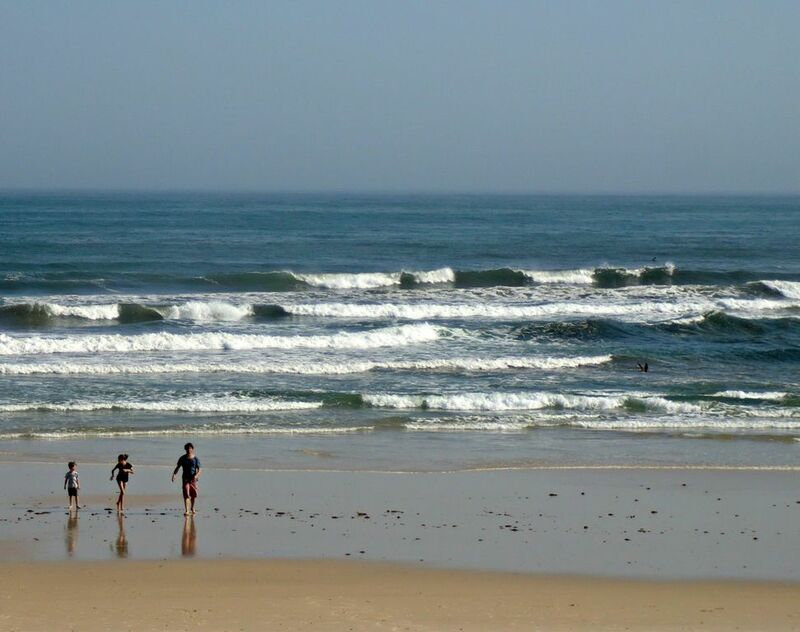 The waves are perfect and powerful stretching along a sandy bottom.You may find, within a 5 minutes drive, beaches for little children and for grown-ups, small beaches enclosed within high cliffs and rocky beaches in Portugal’s most famous beach for health problems. The food is excellent, the sun warm, the sea and the sky perfect blue. The beaches got the EU blue flag. Blending sun, sea and sand, nature and city, the water and the land and the deep blue sky, this place becomes an ideal location for a holiday. Golf: You may use the Atlantico Golfe Hotel Golf course. We have had guests who come to the luxurious Praia D'El Rei resort, which is nearby, about 10 minutes drive. Please contact the owner for details. Bookings may be done through us but in England, through golf bookers, the prices are better. Changeover is on SATURDAYS, with exceptions Ø Please, contact the owner for further details Ø 30% deposit when making the reservation. Balance payable 6 weeks before arrival. Ø Check-in after after 4.00 pm and departure up to 10.00 am. The break is for house cleaning. Ø Rental is on a self-catering basis and is inclusive of gas, water and electricity.